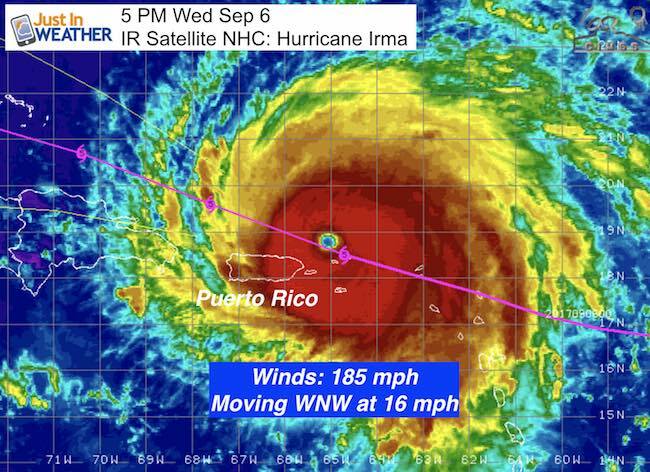 Hurricane Irma is rolling north of the Virgin Islands and Puerto Rico holding wind speed of 185 mph. 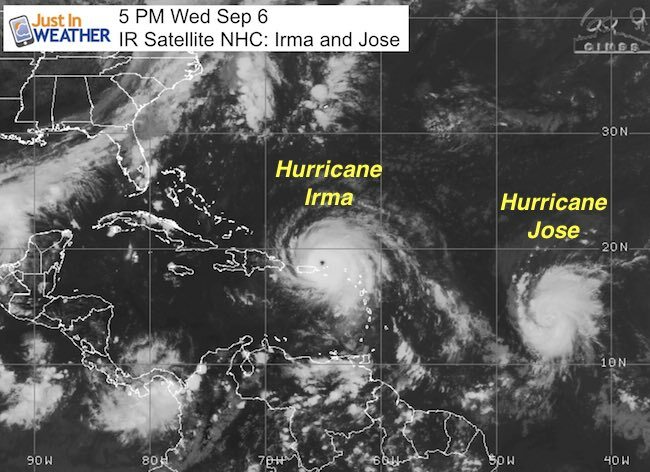 The close up satellite video below is amazing with this textbook stadium effect feature. 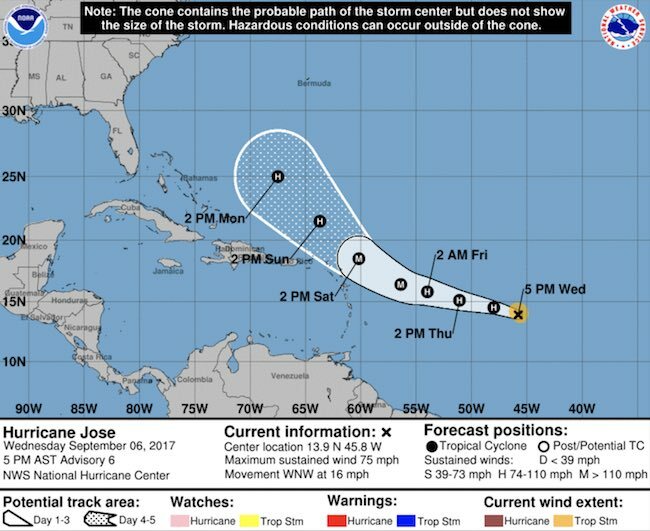 Nearby Jose is now a hurricane as well. This was expected, and the track will clip the northeastern Caribbean then head farther north of Irma’s path. Info on that storm is at the bottom of this post. 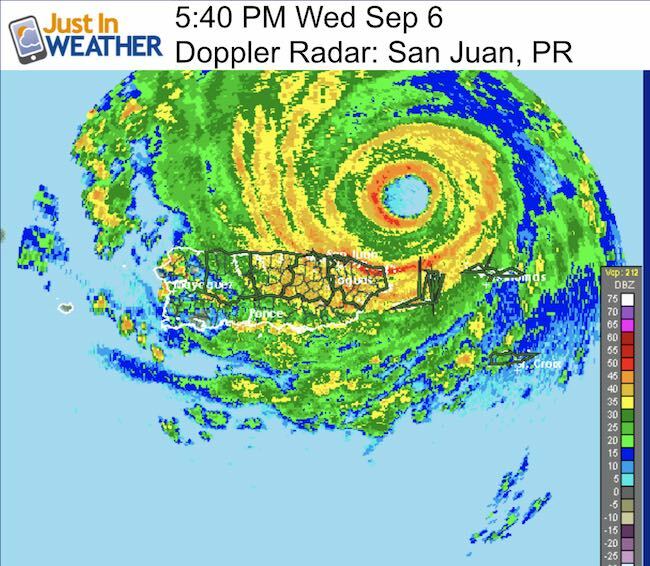 We are in unchartered territory as a storm Irma’s intensity is a very rare thing and pretty much will make up its own environment surrounding it. So trying to plot the track is imperfect, but it provides some idea, especially noting trends of any changes. The purpose of this post is to focus on the potential for Sunday passing along the Florida coast very close to Miami. 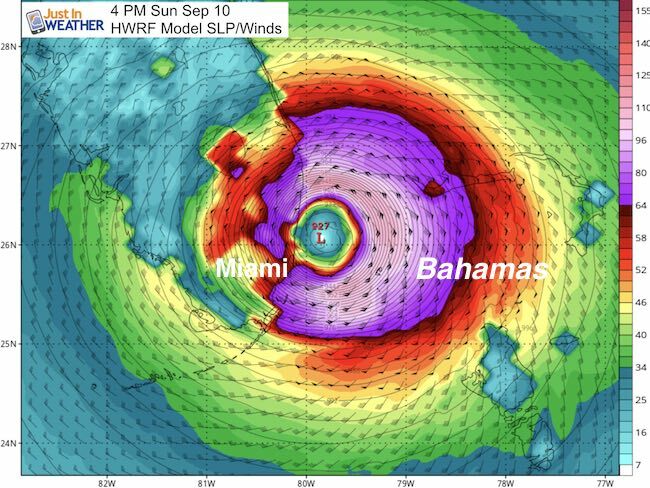 The Bahamas may be in the worst position here, while the US shoreline remains a question mark. 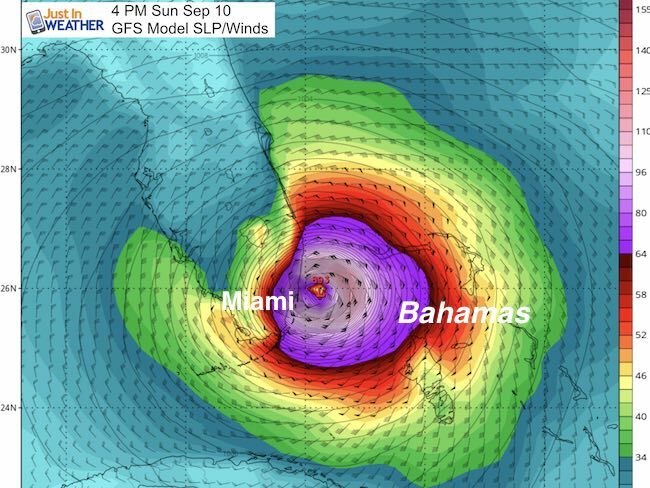 However the storm is larger than the state of Florida and the impact will be widespread. This is NOT Harvey, so instead of stalling, it will move out, but it will pack a much stronger punch. Up until now the tracking I show as well as what you have seen from other forecasters is based on computer modeling. These calculations and maps have shown a wide variety of long range tracks when this reaches the US mainland. Remember the east coast there, then Key West. Now it appears to be back to some of the original thinking, passing off the east side of Florida and then turning into the southeast US. 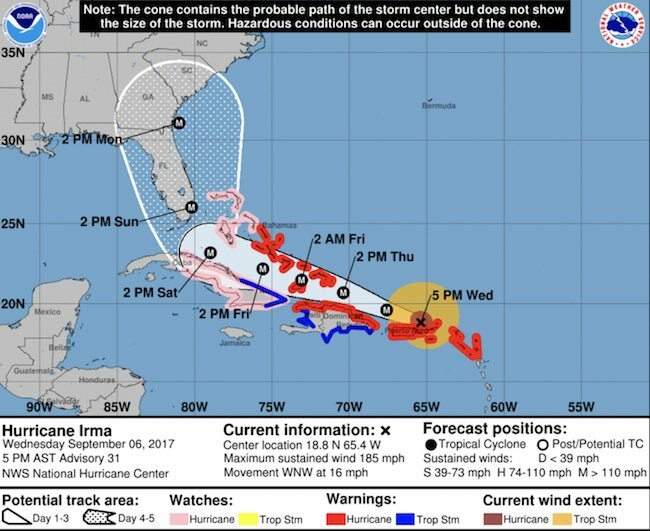 State of Emergency in effect for Florida and the coastal counties of Georgia. The exact track is still not known, but the trend and cone of uncertainty covers a large area. This storm is so large that the immediate impact will cover a few hundred miles of shoreline, plus the waves propagating a surge farther out on the north end at landfall. 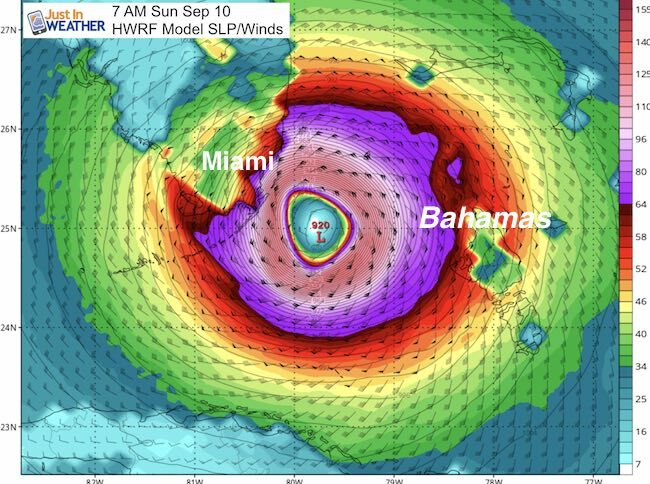 The HWRF Model is showing the track rolling very close to or just east of Miami. I still find it impossible to pin the exact location of the eye 4 days away, so please consider that this is east of the forecast from yesterday. I would like to see at least three consecutive model runs showing consistency to start locking in on landfall or eye wall scraping up the coast. This is the American Model that has been the most consistent with the track staying on the east side of Florida. It deserves the credit for that and worth the longer range look here. Notice the track with final landfall on the Georgia/South Carolina border. Then the push to the northwest into Kentucky. This is due to the same strong High Pressure off of the New England coast I mentioned last week. This set up would push the storm inland and dissipate well west of Maryland. Cuban provinces of Guantanamo, Holguin, and Las Tunas. Saint Martin and Saint Barthelemy. 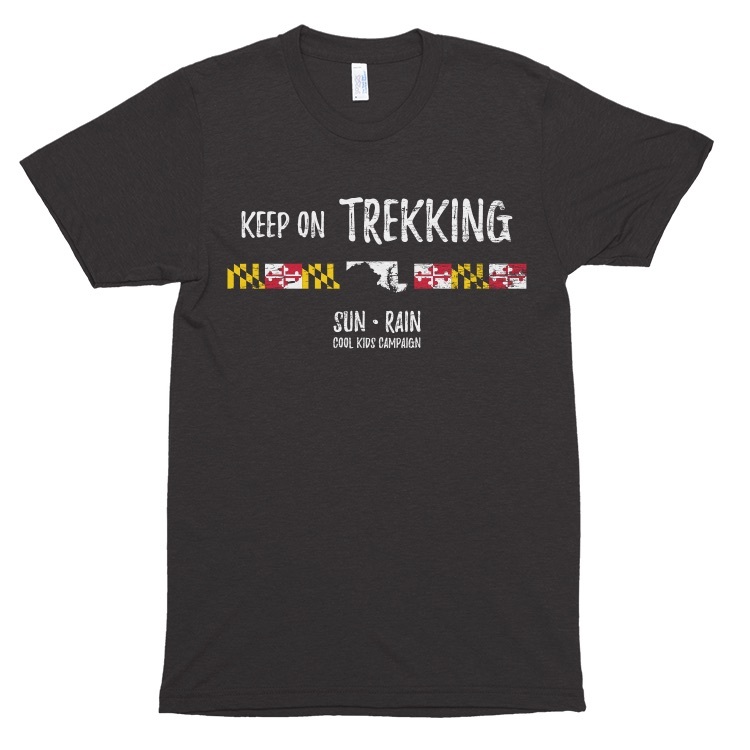 Continue to be part of our Maryland Trek and Support Cool Kids Campaign. This was our best event yet and we want the message to carry throughout the year. Proceeds go to programs that help children and their families ensuring cancer treatment.